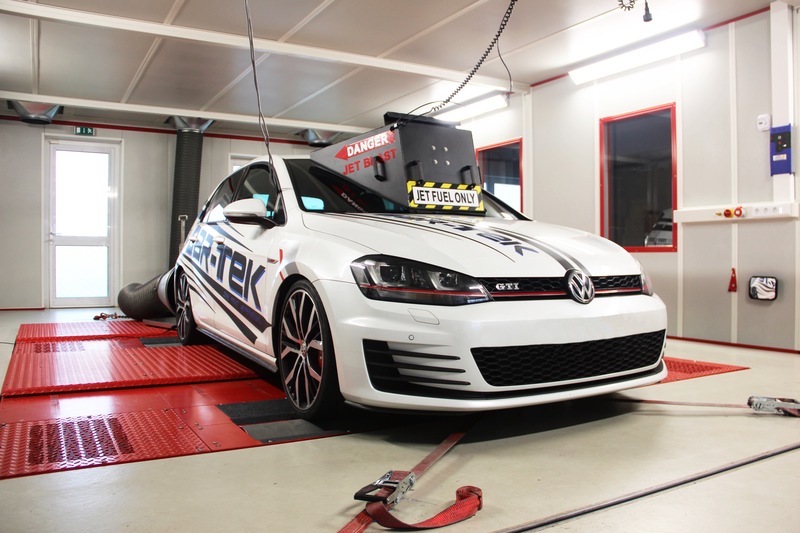 Golf 7 GTI TSI – our new tuning project! The Golf VII is a load of fun and wasn’t voted European Car of the Year in 2013 for nothing. 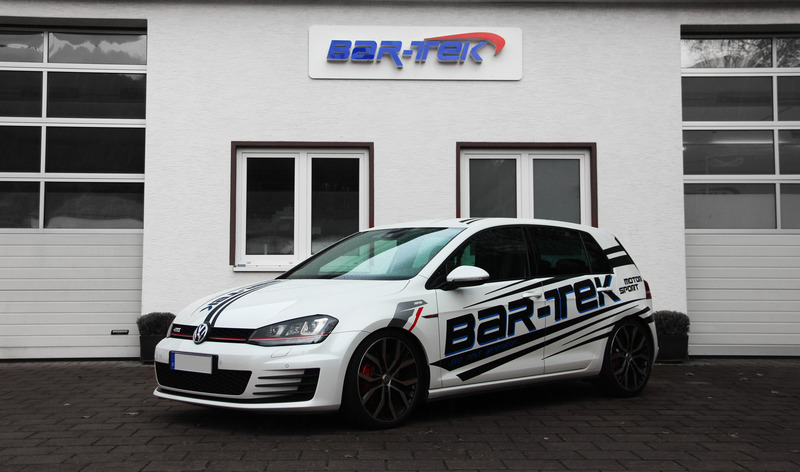 We share this enthusiasm and after our last project with the Golf 6 GTI, we got started on our next engine concept right away: the Golf 7 GTI TSI project. The engine of the Golf 7 GTI TSI is the latest 4-cylinder engine featuring a timing chain and is considered the latest T(F)SI generation: the EA888 Generation 3. (You will find the differences between TSI and TFSI engines here.) As standard, the two-litre, turbo, petrol, direct-injection engine in the Golf 7 GTI boasts 230 HP (169 kW) of power and reaches a top speed of 246 km/h. Also in terms of technology, the Golf 7 is a step ahead of its predecessor. For one thing, the timing chain is way better. The engine in the Golf VII is installed transversely, so the Golf 7 is included in VW’s MQB platform: The Modular Transverse Matrix replaces the previous platform concept and standardises assemblies. This way, many more vehicles can be produced. But it’s not just the quantity that has been improved at VW. The new modules allow for combinations of different wheelbases and track widths. The new Golf sheds a lot of weight through the use of hot-formed steel and dual-phase steel: More than 100 kilos have been saved. Our Golf 7 GTI project: driving thrills for real tuning fans! This hardware has been coordinated with our chip tuning (stage V1) on our Maha MSR performance test rig. 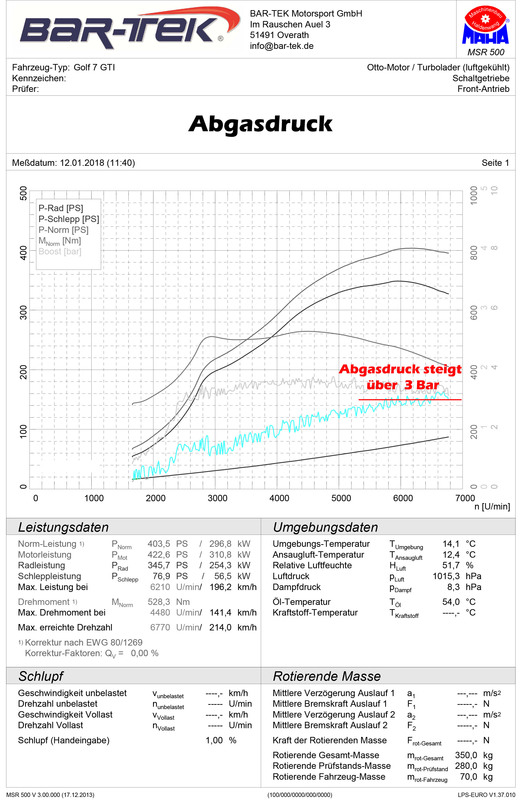 In our tuning guide for the Golf 7, you will find all information about the tuning stages. Milltek exhaust system starting from the cat. 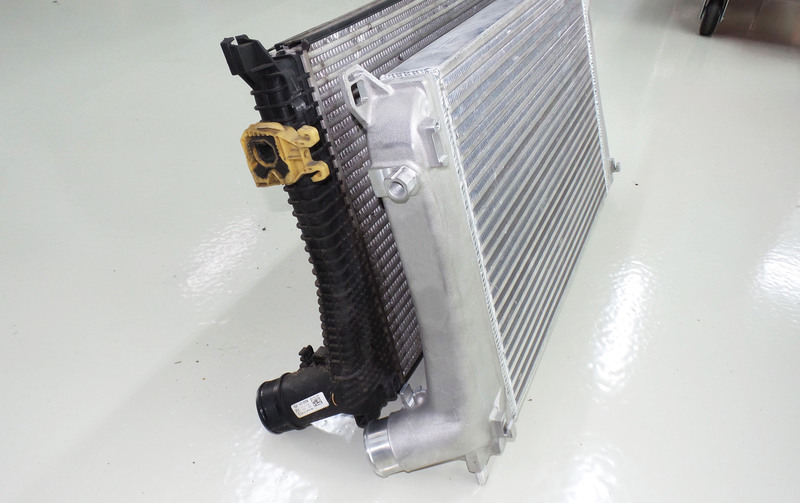 However, the most important component in this project is the charge air cooler upgrade. We have found the series charge air cooler to be completely overwhelmed at this performance level. Here you can see the increased power and torque compared to series production. After the first two tuning stages, the Golf 7 dishes out quite a bit of power on the road. Here is a comparison of the charge air coolers. On the left is the original and very weak OEM charge air cooler. On our test rig, we had to abort already after two runs, because the charge air temperature simply got too hot. 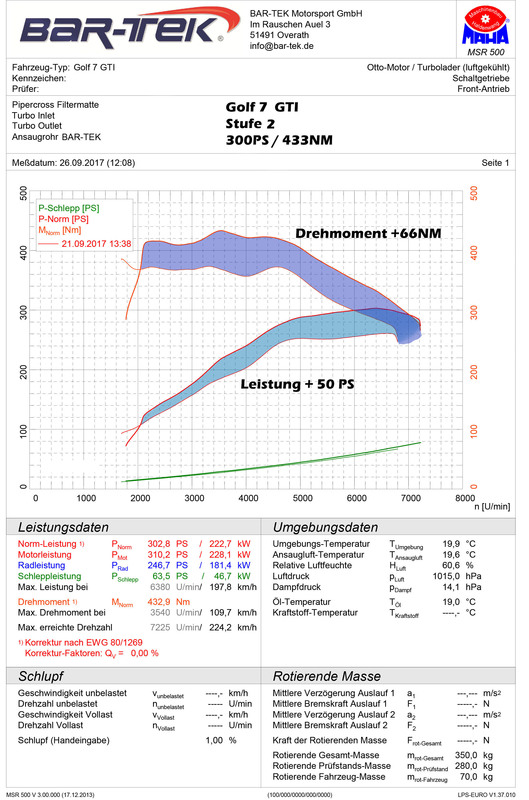 Thanks to the charge air cooler upgrade, the temperature never exceeded 30° C.
Stage 3 completed: Our Golf 7 now delivers 400 HP and 512 Nm. In addition to the parts from the first two stages, we have also installed an upgrade turbocharger at level 3. From here, we recommend that you install a reinforced sport clutch for DSG transmissions. This conversion was coordinated on our Maha MSR 500 with chip tuning stage V3. For this stage as well, we have made the comparison with series performance clearer to see via a figure. Looks like Christmas? Feels like it, too! With 400 HP and 512 Nm, the street is all yours! At this performance level, it is quite clear that the standard exhaust is pushed to its limits. We installed the complete exhaust system already at stage 2. 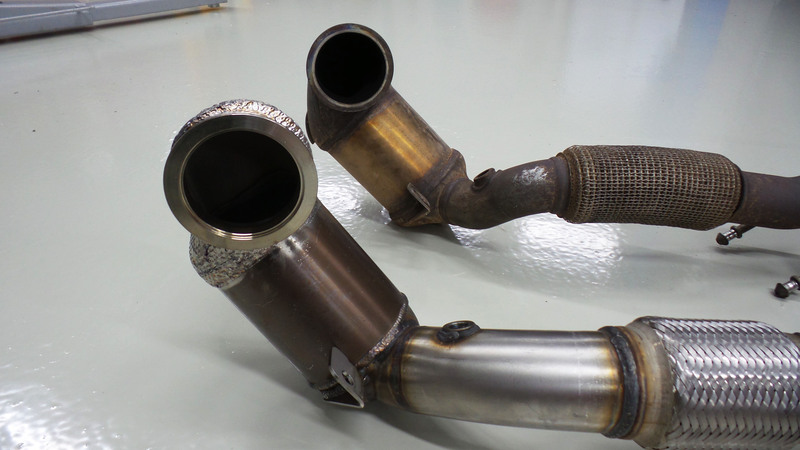 The exhaust back pressure (measured in the turbo) rises to 3 bar with 1.5 bar boost pressure! As a rule of thumb: The back pressure may only increase by a factor of 1.5 with respect to the boost pressure. So for our Golf 7, this means a maximum of 2 bar. Do you want to get everything you can out of your Golf VII? 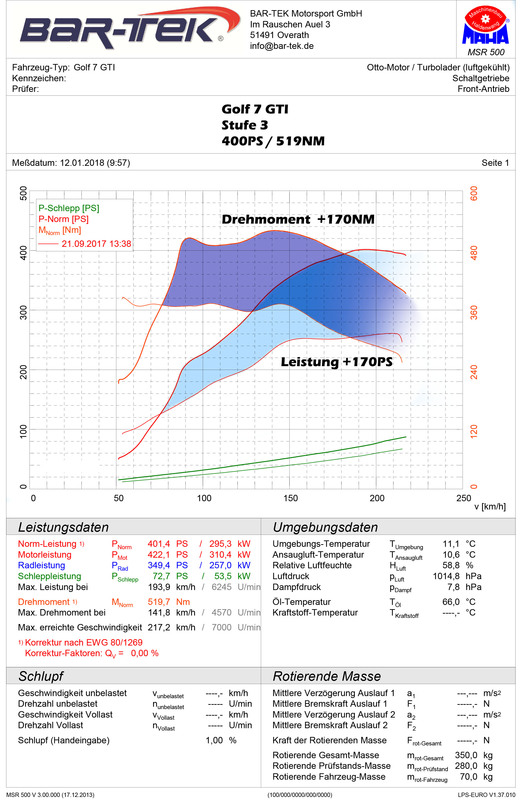 Of course, we will keep you up to speed and soon report on the next tuning stage of our Golf 7. If you have any questions or also want to harness your Golf’s full power on the road, then get in touch! We will give you expert advice and will be happy to professionally install all parts. Just give us a call or email us!